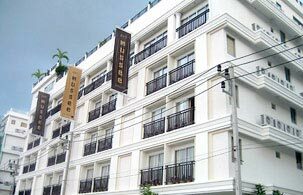 Mussee Patong Hotel is stylish accommodation in Patong. Its concept is inspired by demon king Todsakan character who got ten discerning faces and 20 powerful arms. Mussee Patong Hotel allows guests to see Patong, Phuket Island and life in different perspectives. The hotel provides total 60 guestrooms in 3 types including 30 sqm Superior, 32 sqm Deluxe and 90 sqm Suite for both daily and long term rental. As the location is close to famous Patong beach, entertainments and renown attractions just only a few minutes away, Mussee Patong Hotel can be undoubtedly considered an ideal accommodation for travellers who looking for a tranquility but still cannot abandon comfort and convenience. Check-In time is 2:00 P.M. The hotel will make every effort to accommodate early arrivals. Requests will be handled on an individual basis and will be depend upon the hotel's current availability. Check-out time is 12 Noon. A late check out and additional cost of 100 Baht/hr will be charged. After 06:00 P.M., the rate of one night stay will be charged. The breakfast starts 06:30 A.M. until 10:30 A.M. Without any confirmation, the reservation will be hold until the fewer 3 days to the arrival date. The hotel will be automatically canceling the booking. 3%. Tax surcharge for Credit Card Payment. The additional guest above the rated number of guests for an accommodation is 500 baht per person, per day. Room key: In case of Key and Tag loss, the locks have to be replaced; the charge of 1,500 baht will be applied. All rates are quoted in Thai Baht and are inclusive of ABF, VAT and service charge.